Aam kheer or Mango payesh is a pure bengali delicacy served on hot summer afternoons. In Indian cuisine, Payesh/kheer or payasam is normally made with rice cooked in thickened milk. But in Bengali cuisine, kheer is also prepared with seasoneal fruits, like Mango or Orange(check orange kheer in Sandeepa's Blog). It is very easy to make and a delightful frozen dessert for Summer. It can be made from fresh mango in season or canned mango pulp available throughout the year. If using fresh mango, take out the pulps and cut into pieces, then make a puree in a blender. In a heavy-bottomed pan, pour the milk and bring it to boil. Then simmer the stove and let it boil until it reduces to half. Take the pan out of the heat, add the mango pulp and half of the chopped pistachio and rose water. Mix well and add sugar according to your taste. If adding sugar, put the pan again on the heat but in low flame. Keep stirring. Allow it on heat for about 5 minutes. Remove the pan and garnish with rest of the pistachios and saffron stands. 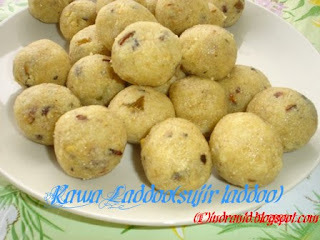 Cool it in room temperature and keep it in the refrigerator for about 4-5 hours before serving. Serve cold or can be served in room temperature. And to Shanthi Krishnakumar's event "State special"
Also reposting my older post Rawa Laddoo for this above mentioned festival and sending it to Dido. Happy Ganesh Chaturthi to everyone , which is 23rd August this year is celebrated to worship Lord Ganesha on his birthday. This festival lasts for 10 days. Ganesha, the elephant-headed son of Shiva and Parvati, is widely worshipped as the supreme god of wisdom, prosperity and good fortune. While celebrated all over India, it is most elaborate in Maharashtra, Goa (Biggest festival for Konkani people all over the world), Gujarat, Karnataka, Tamil Nadu and Andhra Pradesh. 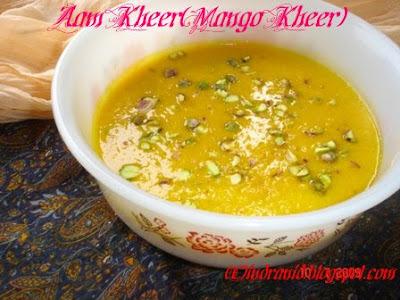 hi frst time..u have grt collections...mango kheer looks grt..thx 4 sharing!